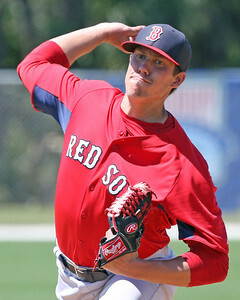 Season in Review: It was a tough season for Light, one of three 2012 first-round picks for the Red Sox. Starting his first full pro season in the Greenville rotation, he went 25 2/3 innings and compiled an 8.06 ERA with 24 strikeouts and 13 walks, giving up 37 hits. He left his next start, on May 22, after one batter, and after a DL stint and nine days off, had the same thing happen in his next start on June 1. A torn hamstring then kept him out of action for two-and-a-half months. After rehabbing the injury in Fort Myers, Light made three August rehab starts in the Gulf Coast League, slowly building up over three appearances without allowing a run. He returned to Greenville for one final start on August 31, going 2 2/3 innings, allowing five earned runs on seven hits and a walk while striking out four, before joining McGrath and others in the Fall Instructional League.